I wanted to say thank you so much! I can't believe I have over 200 followers and I never thought I would have met so many amazing people with my blog. I am so lucky to have meet you. I have learned so much from doing a blog and have even become a little braver. :) Thank you! Tim told me that my green dress looks like a Starbucks apron. I told him that you don't wear a bow belt with a Starbucks inspired dress! how cute are you?! love the green, and congrats on 200-plus followers! your sure deserve all your followers. i know how you feel! When I reached fifty followers I couldnt believe it. LOL! Love the dress comments! Too cute! you are so cute and you do love coffee! You have another new follower! You are so cute! Enjoy your weekend! How have I never found your blog until right now? You, lady, are awesome! I'm loving reading your stuff! 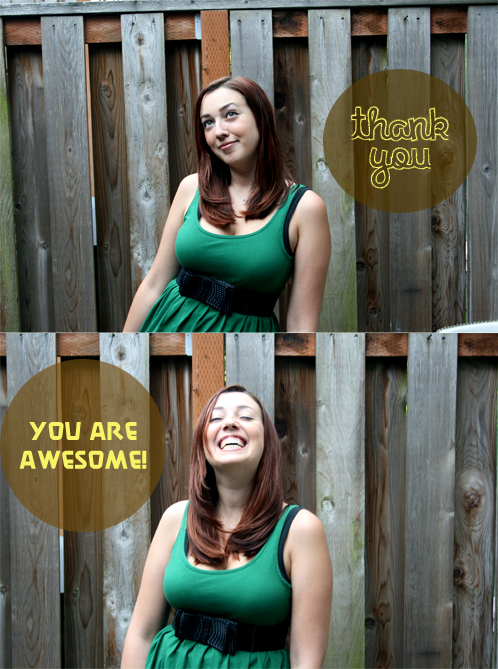 New to your blog, and this seemed a good post to stop and say Hello and Congrats! !